A couple weeks ago I featured a fanzine as the Free GM Resource and it occurred to me that I never put up the game the fanzine was for. 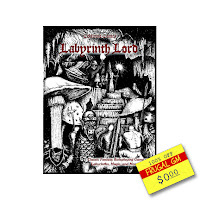 Labyrinth Lord is one of the "old school clones" made to emulate a specific version of a well-known Fantasy Role Playing Game (FRPG). Depending on which specific version/printing of the rules you want to emulate there is a version of Labyrinth Lord for you. The great thing about Labyrinth Lord is that you have a lot of choices. Not just on which rule-set to pick up, but how you want to get the rules to begin with. There is a free PDF option which has no art, a rather inexpensive PDF option with art, and you can even get the rules printed up with a variety of binding option through their Lulu storefront. I'm going through the rules now, but I don't plan on offering a review, mostly because I don't like reviewing complete game systems. What I really like is the wealth of options for getting these rules. These days I just about require my RPG materials to be in physical and electronic formats. A lot of my gaming occurs outside of my house and I love having my reference materials on my iPad for gaming on the go. 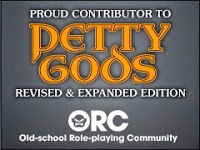 While I have my preferred FRPG, I wouldn't mind playing a one-off now and then. Being able to supply my players with needed reference materials for free is great. If they wanted to start a campaign using Labyrinth Lord then we could all just purchase the versions we preferred. I like it when a publisher gives us a "gateway" to encourage us to try their game.